We are surfing searching, surfing, shopping more than ever before. The brands of just a few large U.S. Tech companies are dominating our lives. Google, Amazon, and Microsoft released earnings recently and they all beat Wall St.’s estimates. Google’s parent company, Alphabet, posted a profit of $4 billion, which is up 45% from last year. Sales ran in at $15 billion, which is up 15% from the previous year. Most of its growth comes from mobile searches and youtube. Google purchased Youtube in 2006 for 1.65 billion. Today, YouTube generates almost $6 in revenue a year. Alphabet can boast that 6 of its consumer products have at least 1 billion users globally. Amazon shocked investors and turned its second straight profit. Sales rose for the third straight quarter. Sales rose 23% to $25 billion. This year Amazon surpassed Wal-Mart to become the world’s most valuable retailer. It has 294 million customers worldwide. Finally, Microsoft posted a profit of $4.6 billion, which is slightly up (2%) from last year. Cloud sales for Microsoft soared 8% in the third quarter to $5.9 billion. So far this month both Amazon and Alphabet stocks have shot up more than 10%. Microsoft shares are up even higher going over 20%. Amazon CEO Jeff Bezos is now America’s third richest person. Microsoft shareholders were happy to hear the its search engine, Bing, has finally reached profitability for the first time since 2009. There are some people who worry that technology companies are becoming too large. For example Google runs two-thirds of all U.S. online searches. Amazon is the first stop for one-third of Americans who are looking to buy anything. And Microsoft Windows has an 83% share of the desktop computer market. Should these large behemoths be constrained? These profit numbers are pretty outstanding. Very extraordinary. One big trend is cloud computing. Which is simply computer storage which is not sitting on your local computer or storage unit. Cloud computing allows people to store data on servers somewhere on the internet so clients don’t have to have a big warehouse full of equipment to manage the data. This is often a much cheaper way to store and manipulate data for large corporations that have many electronic files. It’s become a very affordable and attractive way for companies to manage and store their data. The other big factor is mobile search really played out in this quarter. If a company doesn’t have a mobile strategy than it is really falling behind. The surge of internet usage around the world is primarily on mobile devices. Google has been on the leading front with this trend by capturing the value when internet traffic migrates from desktop to mobile units by effectively selling advertising. 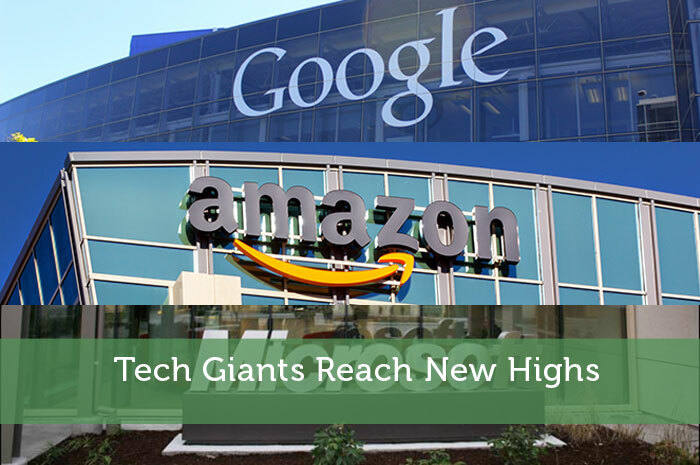 As people live more of their lives online these tech giants such as Amazon, Alphabet, and Microsoft should continue to expand their sales and influence. Their stocks might appear to be expensive today, but in the long run these companies represent proxies for the online consumer marketplace and should continue to grow and profit. This author is long 10 shares of AMZN and 6 shares of GOOG.